SERENITY NOW! ENJOY THIS PEACEFUL SETTING ON 339 ACRE CARPENTER LAKE WHICH HAS A PLETHORA OF WILDLIFE FOR YOUR ENJOYMENT. WATCH THE EAGLES AND LISTEN TO THE LOONS AS YOU ROAST MARSHMALLOWS AROUND THE CAMPFIRE. THIS LOT HAS THE ULTIMATE NORTHWOODS FEEL! THE 103' OF LEVEL FRONTAGE IS SANDY AND THE WATER IS CLEAR-PERFECT SWIMMING FRONTAGE. IT IS A SHORT DRIVE (LESS THAN 10 MINUTES) FROM DOWNTOWN EAGLE RIVER. CARPENTER LAKE HAS PLENTY OF PANFISH, WALLEYE, BASS, AND NORTHERN PIKE. YOU WILL APPRECIATE THE TOWERING PINES AND THE LOT IS OPEN ENOUGH TO PICTURE YOUR CABIN, NESTLED RIGHT IN THIS WOODED LOT. THE LOT IS PERKED AND ELECTRIC AS AT THE LOT LINE. 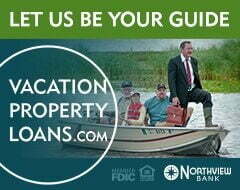 START YOUR PLAN DESIGN AND WE CAN MEET YOU DOWN BY THE WATERS EDGE TO SEE HOW THIS CAN BE THE PERFECT FIT FOR YOUR NORTHWOODS GETAWAY!